Have I said I am in love with #VNPS - Vertical, non-permanent surfaces. I am having fun coming up with challenging problems for the students to work on together. But, even more excited about the conversations that are happening. Just like the research shows, they are engaged right away and off to work. They are working the entire time. They are organizing their work because they know they all have to be able to interpret it. They are labeling units! They are drawing beautiful graphs. They are standing back and looking at their work. They are correcting each other politely. They are learning other strategies from others. I could go on and on. I love it! 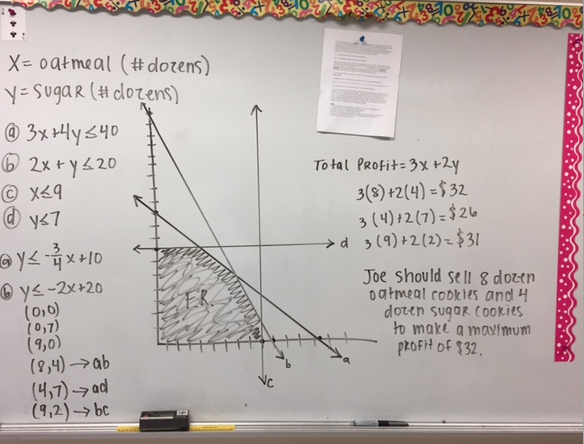 In my Accelerated Algebra 2 class, we had a lesson on Linear Programming today. I also teach Accelerated Algebra 1 so I know they have had the material before but it was challenging. I asked what they remembered from Algebra 1 and heard crickets chirp. So, I decided to have them dive into a Dirt Bike Competition from Illuminations NCTM. I did the entire packet last year. Printed off about 10 pages of papers for each student. I had them work in groups and it was sort of clunky as they tried to fumble through it. This year, I consolidated it to a front and back of a piece of paper with directions to go step by step and keep everything on the board. Here are my #VRG (visibly random groups - love flippity.net for this) working hard. And, their final problem, all organized. They did so well with it. 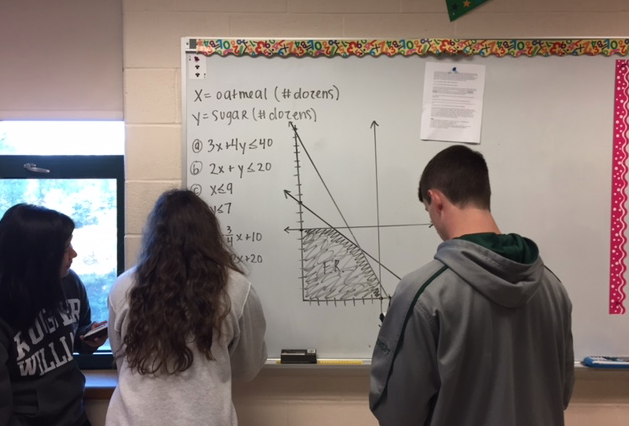 It was a good review of standard form and graphing with intercepts. They also had to remember how to graph a system on their calculator and find the point of intersection. Oh, yeah, when we graph inequalities, we need to include shading. It was coming back to them. They wrote their objective function and found the vertices. It was when they were plugging in these values that it sort of all came back to them "oh, yeah, now I remember this." 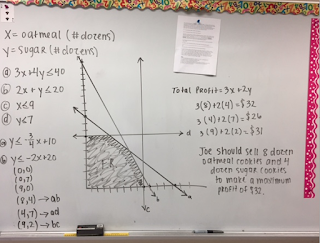 Next, they did a linear programming problem about baking cookies. They did great with it. Here is the condensed version. I could go on and on about how awesome the VNPS but the students and I love it.